AT PHP90 a kilo, I thought these were a steal. And since I had never cooked them before, I decided to buy two kilos to experiment with. And the lady vendor was kind enough to pick through all the contents of her blue plastic pail to get all the smallest octopodes for me. I do have a couple of posts on “pre-teen” or maybe “single-digit” octopodes and octopode dishes, here and here. 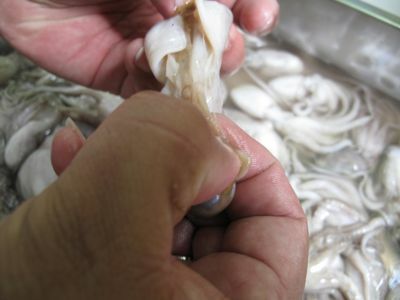 Locate the brains, guts, ink sac of the octopuses and gently but firmly tug on it until the connective tissue/muscle gives or tears. Discard the muck. Rinse the octopi and either keep them whole, as we did, or sever them into pieces. Some recipes only call for using the tentacles, but I find it wasteful not to use the heads. I don’t quite remember the show, but I remember this one sushi chef slam a slice of tentacle. It puffed up a bit and then was served nigiri-style. That was interesting. In Hawai’i this is served as an appetizer in Japanese, Korean, or local style. All wonderful! what a coincidence..had some korean soup with octopus last night. thanks for showing how to clean them. have been tempted a couple of times to buy in the market but i never knew how to clean them..but now i think i do. excited to know what you did with them, MM. fried in olive oil with lots of garlic, i think! With the huge Greek community here in Melbourne (used to be the biggest Greek population outside of Greece – used to be), baby octopus is huge here. Having Greek “wog” in laws have exposed me a few delightful edibles. 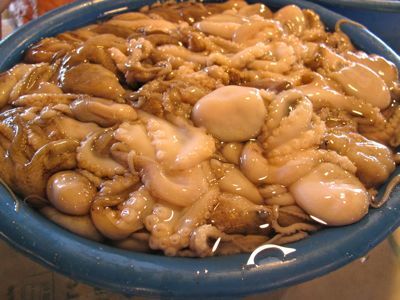 At the local Costco here, the inlaw made me try pickled baby octopus (which they said was a very good buy @$20/k and it lasts months, if at all). It wasn’t actually bad but not the best either – the octopus was tender, juicy and tasty but there was a missing depth of flavor. Marketman, try deepfried baby octopus the next time you’re in Singapore. Quite sweet, almost covered in syrup, yet delicious! 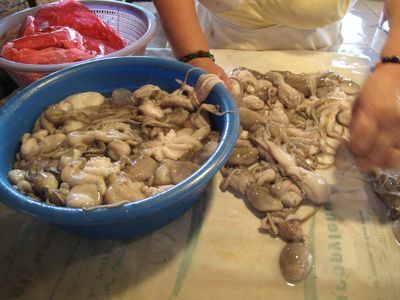 In Korea, raw octopus tentacles are served so fresh that the tentacles are still squirming	as you swallow, and rarely, surgical intervention is required when the tentacle grabs some part of your anatomy. is it just like cleaning squids? looks a bit matrabaho. 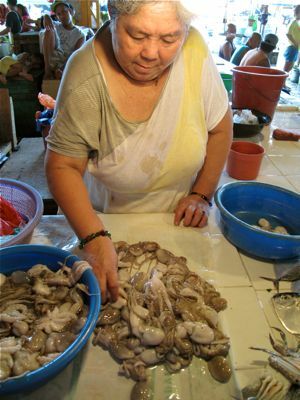 just stir-fry it with sweet chilli sauce and few pieces of skinned prawns, some fresh vege salad with lots and lots of fresh onions, and steamed rice tsibog na…. !